Perhaps best known for playing host to 'The Tales of the Three Brothers', The Tales of Beedle the Bard is a collection of five short stories written by J.K. Rowling as an accompaniment to the Harry Potter series. The tales found inside can be likened to the fairy tales we would hear during childhood, however these have a magical twist to them. Alongside 'The Tales of the Three Brothers', you'll also find inside: 'The Wizard and the Hopping Pot', 'The Fountain of Fair Fortune', 'The Warlock's Hairy Heart' and 'Babbitty Rabbitty and her Cackling Stump'. All of the stories are well written and remain in my mind weeks after reading, with my two favourites being 'The Tales of the Three Brothers' (obviously) and also 'The Fountain of Fair Fortune'. The book itself isn't too long, just over 100 pages, and I read through it quickly. I felt immersed in the wizarding world once more, and was full warm fuzzies whilst reading - the kind of feeling you get when you return home from a holiday. Something I really enjoyed, besides the stories, was the fact that each story has commentary by Dumbledore at the end of it, with some insight into the perception of the story and how they have changed over time etc. I thought this a nice inclusion. The same can be said for the illustrations in this particular edition - they are just stunning! 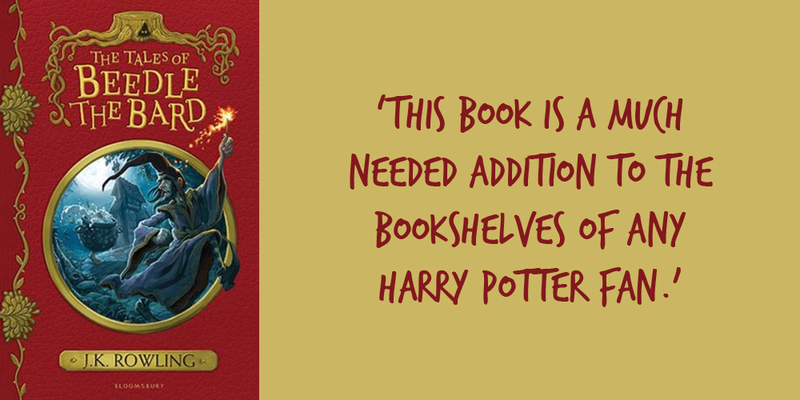 This book is a much needed addition to the bookshelves of any Harry Potter fan. I can't believe it took me so long to buy! Great review! I love this book and plan on rereading it when I finish rereading the other Harry Potter books. I’m on the fourth book right now. I hope your Harry Potter reread is going well! I agree, this is such a good book if you are a Harry Potter fan! I have never read this. It sounds like I definitely need to! If you're a Harry Potter fan then I definitely recommend it, Erin. I've owned this one for a while, but haven't read it yet, and I don't know why. I love Harry Potter, so I'm eager to dive into the world in a different way. It's on my list to read this year, so I'll be getting to it sometime soon! I hope you're able to read this title soon Julie, especially seen as you already own it. A short read; doable in an evening. Although short, it is still very magical.